Ethyl ethanoate is the ester produced when ethanol and ethanoic acid react in the presence of an acid catalyst. The ethyl ethanoate produced is an ester. The reaction is called esterification. The reaction can also be described as a condensation reaction because water is made when two molecules join together. Ethyl ethanoate is an ester. To work out the structure of the ester formed when an alcohol reacts with a carboxylic acid, it is easiest to first draw the structures of alcohol and acid and then remove the H₂O to see what is left when the molecules join. 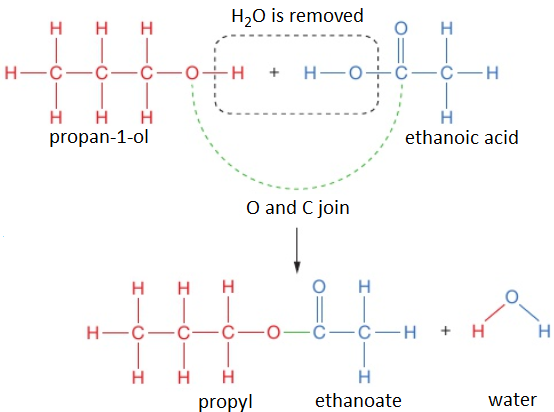 For example, propan-1-ol and ethanoic acid react together to form propyl ethanoate and water. 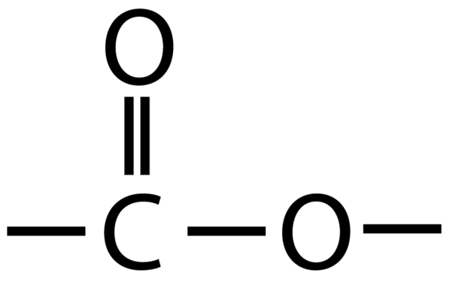 This is still called propyl ethanoate: the alcohol bit of the name (propyl) comes first and then the carboxylic acid bit (ethanoate), even though the displayed formula is typically written the other way around. Notice that the structural formulae for esters is also typically written with the carboxylic acid bit first, so propyl ethanoate is CH₃COOCH₂CH₂CH₃. Heating a mixture of ethanoic acid and ethanol produces a liquid called ethyl ethanoate. A few drops of concentrated sulfuric acid must be added for the reaction to work. The sulfuric acid acts as a catalyst. Notice that the reaction is reversible. Pure reactants are used to maximise the yield of ethyl ethanoate. Pure ethanoic acid is called glacial ethanoic acid.